You should never, under any circumstances, buy something from the back of a guy’s van. But a bus... totally different story. Set your homing device to the Glazed Donut Works Bus, a former school transportation vessel turned pink donut-mobile from the same-named Deep Ellum shop, now rolling. Yep, this thing used to carry kids to and from learning institutions. Now it carries donuts around town and serves them out the back door. So chalk that up as a victory. For you, anyway. Locations aren’t all solidified yet, so you’ll want to keep your ear to the ground. Or just check Facebook and Twitter, if that’s more your thing. 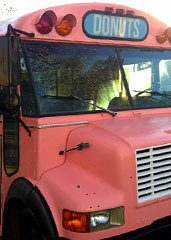 Either way, you’ll be seeing this bus around Deep Ellum as they launch a two-pronged donut assault on the neighborhood. 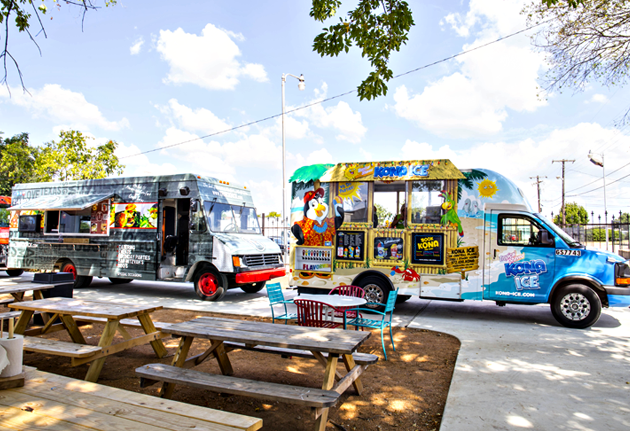 And soon, it’ll begin parking at curbs across town, serving five to six favorites each day, from intriguing donuts (like fresh-stuffed strawberry and pineapple old fashioned) to oversize cinnamon rolls made with the donut dough. And here’s a crazy thought: maybe you’d like to secure their services for the day. In that case, just call them up to discuss terms (four hours, 50 people, donut grilled cheeses for everyone) and they’ll come cater your event. Looks like another successful Arbor Day.